Sitting in traffic behind this car I was flooded with writing ideas. Which one of my characters would drive this car? Did they add the stickers or did they come on the car? How can a person believe in all of these causes at once? Or was each one the belief of the month? 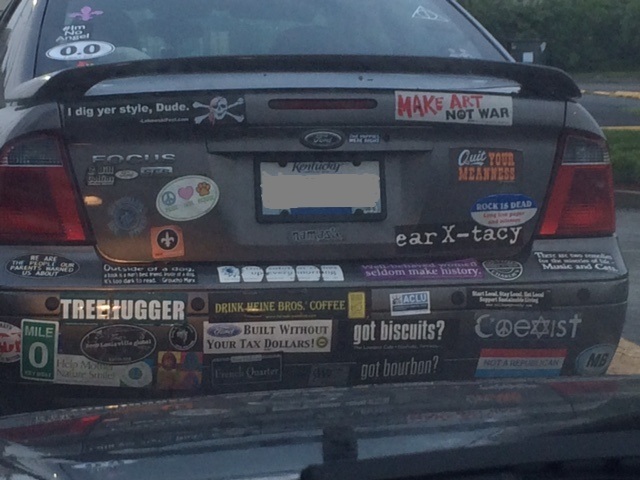 What if this car was in a wreck, could they separate the damage from the mangled bumper stickers? What does the driver look like? Are they young? Are they old? Clean-cut or sloppy? Jimmy was the youngest of six kids. When the county fair came each kid was given money for rides and games. When it was gone, it was gone. Jimmy was too short for most of the rides other than the merry-go-round, which he was quickly board with. He wanted to ride with his brothers and sisters, but he was too tall. While mom watched us kids, dad would always scoop Jimmy up and take him to play the games. He always seem to come home with a prize. None of us could ever figure out how. Our money didn’t last long enough to knock the right pins down or land the ring on the peg. Alice finished the Y on the birthday cake. It was perfect. Placing it gently on the table she quietly called the rest of the family around the table. Emily, the mopey teen-ager was convinced that middle child syndrome had set in again and they had forgotten her birthday. No amount of encouragement from her mother changed that. With a final adjustment to the gifts and cake, with her brother and sister standing by with balloons Emily was called downstairs. “What!” As she stomped down the steps to be stopped in her tracks by the site. The doctor said the aquarium would help Fred relax. Having it set up in his office with fish he enjoyed. Some he had seen on diving trips. Yea, diving trips. Maybe watching the fish swim just reminded him of too many things. The day Spike came home was the first time in a month Joey had smiled. Their day had been seventy-five degrees and sunny. Beautiful. Christine spent the day feeling like a princess. She and Paul had prayed together the night before for peace and joy on their wedding day. The sadness from the funeral earlier in the week had taken a backseat to their day. Before they disappeared to the honeymoon suite they took a walk on the beach. Their conversation was quiet, they had to remember him on this day. Tina loves autumn. The trees and their color change always stirred her heart to want to slow down. The smell of damp leaves and the crisp crunch under her feet as she swept the sidewalk reminded her that change was in the air.